"Also, Gwonam told me that my sword was enough!" "You've lost your weapons and the contents of your backpack somewhere during the journey. All you have are the clothes and armor on your back. This leaves you with four burning questions: Where are you? How did you get here? Who brought you here? And how in blazes can you get out of here? No, make that FIVE burning questions: In what city did your luggage end up THIS time?" 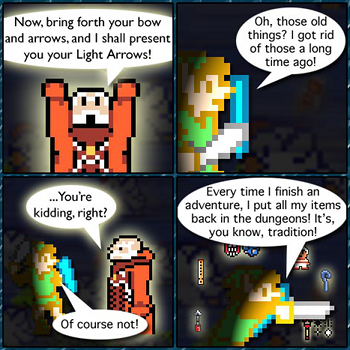 Items and experience levels do not carry over to game sequels, regardless of time passed. This makes less logical sense if something is a direct sequel, although the short explanation is that it's to present an honest challenge to the player. This is usually accepted by the player, although a few games attempt a weaker explanation. Maybe the hero was on vacation and didn't bring his stuff along because he thought he wouldn't need it? Maybe it had been several months, even years, since the world last needed saving, and therefore the hero has gotten a bit out of shape? Perhaps his equipment was stolen from him by physical, or, more commonly, magical means? Whatever the case, at each new game, the protagonist will be back at square one. Also, if the prior game would have allowed you to have different things - or you never played the previous game - one might ask, "how come my character now has extra item(s) I did not have at the end of the previous game? ", which might be a more serious question. Since it allows each game to stand alone in terms of story development, if not events, it is roughly equivalent to the Snapback and Reset Button story tropes. Of course, not all games are like this. Sometimes, a direct sequel might start the character with the powers from the previous game, giving them A Taste of Power before taking them away and making the character start from scratch again. If the game actually acknowledges personal data from a previous title in the series, it's an Old Save Bonus. Non Linear Sequels avoid the whole question. Compare No-Gear Level, for when this happens inside the game itself. Reinventing the Wheel is a Real-Time Strategy version. See Overrated and Underleveled for a common justification. If you do keep your powers, you're probably going to find out that they're So Last Sequel.